As a parent of an elementary age child something that is always not far from my mind is how to infuse in my son a bond with, and respect for, our natural world. We live in such a different society than we did when I was a child. There was a freedom for creative and natural play that just no longer exists. Growing up, my favorite past-time by far was to disappear into the woods and wetlands near my house for hours at a time. Seasonally I would wander through the extensive meadows and fields associated with the farm at the end of my street; watch the dragonflies and damselflies do their summer aerial acrobatics at a kettle-hole pond; catch tadpoles, frogs and salamanders from the woodland vernal pools; climb the tall oak and maple trees; ice skate on the isolated cranberry bog and create an adventure out of following the animal tracks through the dark woods in the snow. At the age of eight I was one with the environment and its natural calendar. Unknown to me at the time it was an escape, a healing experience and an invitation to learn and be sensually motivated by what I experienced. Even more amazing that feeling I internalized would be with me my whole life. Now I am concerned because I see our kids, whether they are growing up in urban, suburban or rural areas, mostly wired to technology with little to no time or even inclination to freely experience nature or the world around them. 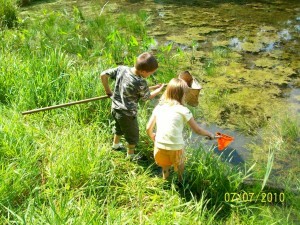 They spend much less time outdoors then previous generations ever have. That is not to say they are not educated about nature in the classroom, but they are continually distracted by endless technology and unfortunately classroom education is designed to meet standardized testing requirements with less hands-on understanding and tactile learning. What’s worse, in many communities outdoor play as we knew it is no longer allowed. I actually read recently that three 12-year kids in the U.K. were arrested, DNA tested and locked up for climbing a tree and breaking branches with the intent of constructing a tree house. Here in New England before we moved to Chelmsford we lived in an association-dominated community where leaving bicycles or playthings in the front yard was prohibited, a toddler riding a tricycle on the sidewalk was a pedestrian safety concern and the noise from bouncing a basketball was considered a public nuisance. Allowing an unchaperoned child outdoors could easily brand you an unfit parent. Even without these community limitations the opportunity for outside free play is minimal giving the loss of vacant lots and free space due to urban sprawl and/or dense development. We now live in a society where backyard tree houses are regulated by local ordinances, fishing or catching tadpoles in a neighborhood pond is a safety or liability issue, as is climbing a tree in a public park. This lack of opportunity for outdoor play has been receiving a lot of attention lately, and for good reason. 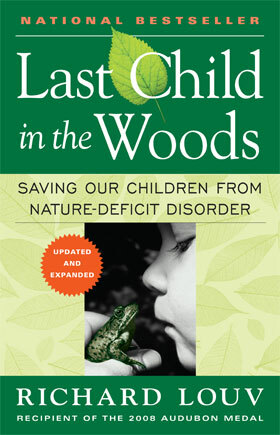 Child advocacy expert Richard Louv and the author of a book I am currently reading entitled “Last Child in the Woods” provides alarming documentation that directly links the shortage of nature in the lives of today’s wired generation to some of the most disturbing childhood trends including obesity, attention disorders, and depression. He calls it Nature Deficit Disorder. He is one of the leaders in the recent “Leave No Child Inside” movement and founders of the Children & Nature Organization. Many proactive communities are taking this information in stride and and designating areas for constructive outdoor free play. One term used for them is Nature PlayScapes. What is it? 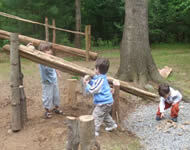 According to one site they are landscapes consisting mostly of natural materials such as water, plants, rocks, earth, branches, or sand that are designed to create a dynamic and interactive play experience. Although they have been around a while they are a tool to be used in spirit of the leave no child inside initiative and they are places that provide kids, families and adults the opportunity to reconnect with the natural world. Another growing initiative and one that I strongly feel should be given a lot more consideration in every school system is the creation of outdoor science classrooms or natural schoolyard habitats. 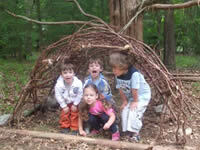 One such example is the Milton, MA Outdoor classrooms. This Massachusetts town was one of the first to implement a school-wide outdoor classroom program in the late 1990’s. 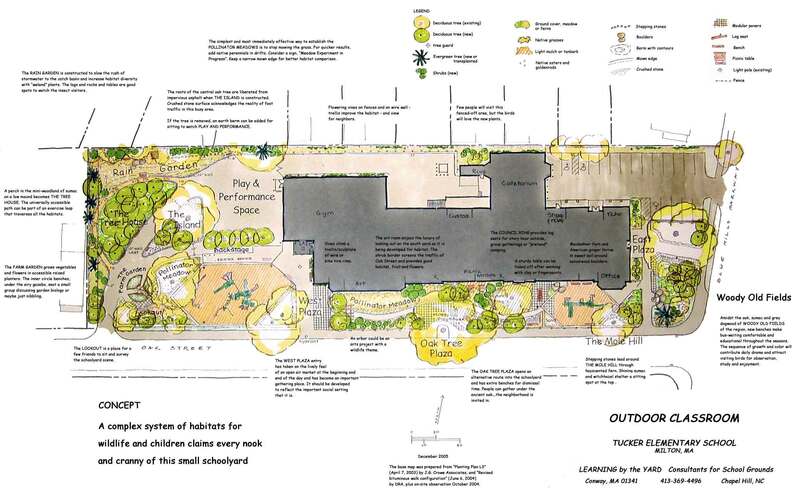 The goal of their program is to create easily accessible natural areas where students have an opportunity to discover their connections with the natural world through hands-on experience. The learning experience is directly linked to the school educational curriculum. The program here, and elsewhere, has been a very successful initiative for rallying the community towards protection and stewardship of its natural resources. Natural classrooms provide a unique opportunity to provide applied hands-on learning in a safe environment without the additional cost of travel or loss of classroom time. In today’s highly scheduled learning system it seems a win-win all around. All it takes is a little bit of initiative, some creativity and community collaboration. Other initiatives I have run into include edible landscapes for school yards and community garden learning programs for children. All wonderful ideas that deserve some thought. So if you are as concerned as I am, lets keep shipping the Leave No Child Inside movement! Unplug your children, take them outdoors and share your love of all things wild with them and anyone else who will listen. Lets nurture and grow the natural stewards of tomorrow.